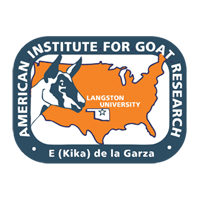 Female Alpine goats, 18 approximately 17 mo of age (yearling) and 18 5-mo-old (growing), were used in an experiment to determine effects of animal age, urea dose (100, 130, and 160 mg/kg BW), and time without feed and water (shrink; 0, 16, and 24 h) on urea space estimates. A 20% (wt/vol) urea solution was infused into a jugular vein, with blood sampled before infusion and every 3 min to 21 min. BW was 49.8, 47.4, and 47.0 kg for yearlings and 26.1, 24.6, and 23.9 kg for growing animals after 0, 16, and 24 h shrinks, respectively (SE = 0.80). Time of urea equilibration with body water, determined by a grafted polynomial quadratic-linear model, was affected by a dose x age x shrink interaction (P < 0.05); yearling means did not differ (ranging from 7.3 to 10.8 min), although those for growing animals were greater (P < 0.05) for 0 h:130 mg (13.0 min) and 24 h:130 mg (13.2 min) compared with 24 h:100 mg (7.6 min) and 16 h:130 mg (7.1 min). Based on these times, 12-min samples were used to determine urea space. Urea space was influenced by an age x shrink interaction (P < 0.05), being similar among shrink times for yearlings (17.8, 18.8, and 18.9 kg) and greater (P < 0.05) for growing animals after 0 than 24 h shrink (12.9, 11.3, and 10.0 kg for 0, 16, and 24 h, respectively). Hemoglobin concentration in plasma, as an index of hemolysis, was lower (P < 0.05) for growing than for yearling animals (1.16 vs. 1.86%), lowest among doses (P < 0.05) for 100 mg (1.05, 1.74, and 1.75% for 100, 130, and 160 mg, respectively), and highest among shrink times (P < 0.05) for 24 h (1.46, 1.42, and 1.61% for 0, 16, and 24 h, respectively). In conclusion, effects of and interactions involving some of the factors studied and high variability in the time of urea equilibration with body water indicate that, regardless of the particular urea space procedures chosen, relatively high numbers of observations are warranted.